« Pagan Parenting: Please, No Christmas Stuff for Baby! As I wake up each day to darker and darker skies, I find myself thinking about the sun a lot. I can only imagine the reverence and hope my ancestors attached to its lengthening rays each day following the Winter Solstice. Adopting it as a central figure in my own Druidism seems more natural each year. With that in mind, I decided to give a Winter Solstice twist to an old classic winter decoration. 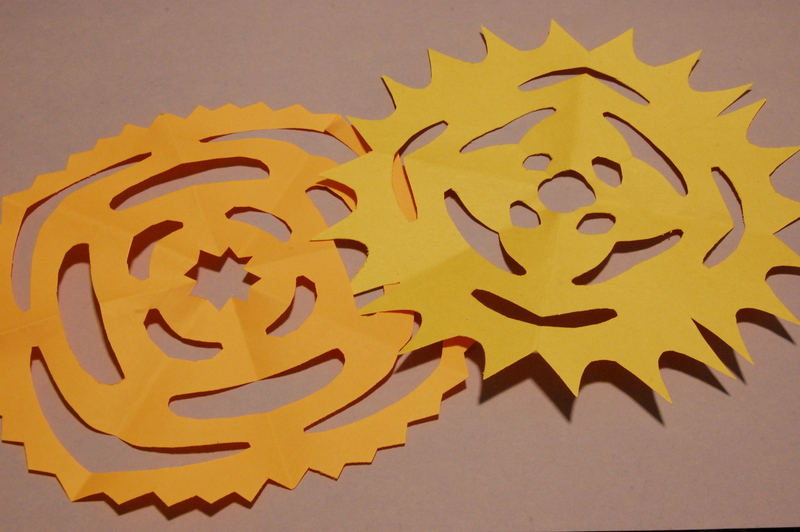 As you make your paper snowflakes, why not make one or three paper suns? I’m sure most of my readers know how to make a paper snoflake, and it’s the same process only making sure to include some solar rays on the outside. For those who are rusty, or if you’ve never made a paper snowflake, here’s what you do! Yellow paper folded into quarters and ready to cut! Photo by Weretoad, 2013. 1) Take a square piece of sun-colored paper. I’m fond of yellow, personally. 2) Fold it in half, then in quarters, then in eights. 4) Cut along the lines near the edge. 5) Add extra designs to your sun by cutting smaller bits away along the fold. 6) Unfold and display with or without snowflakes! If you want to flatten them after the folding process, simply put them between a couple towels and iron on a low setting. Now, even if you wake up to a dark morning, there will still be a reminder of the sun’s warmth. To add further significance to the decorations, leave them up until the Summer Solstice, when the days start to grow shorter again. Put them into your ritual fires and contemplate the seasonal changes.